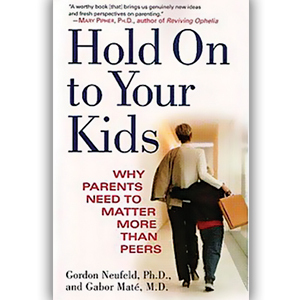 According to Gordon Neufeld and Gabor Mate, authors of Hold On to Your Kids, parents need to matter more than peers. As a parent with a preteen, my child is often being invited to friends’ houses for, what I consider, unusually extended sleep-overs, which leave me feeling old-fashioned for wanting to spend quality time with my kids on the weekends. So I was interested to learn more about how peer orientation stunts healthy growth, especially since it seems like I’m always coming across advice to “let go” of my kids as they age. Once I discovered why it’s so problematic for teens, in particular, to value peers over parents, this title took a place on my must-read list. With communication technology changing more rapidly than ever, it has unfortunately only exacerbated the problem. Neufeld and Mate explain, “We have unwittingly put it into the hands of children who, of course, are using it to connect with their peers. Because of their strong attachment needs, the contact is highly addictive, often becoming a major preoccupation.” That’s why it’s important that we enforce the typical, original reason for the purchase of such technology – easy communication between parent and child. Hold Onto Your Kids reviews how since World War II, we’ve become a culture of missing attachments. Modern America stands in stark contrast to the traditional, multigenerational cultures of our past. As a result, the authors believe that the “natural order has been subverted.” While Neufeld and Mate are quick to clarify that two working parents are not the problem, they do identify the lack of consideration many people give to attachment as problematic. “Because caring for the young is undervalued in our society, day care is not well funded. It is difficult for a nonrelative to meet an individual child’s attachment and orienting needs fully, especially if several other infants and toddlers are vying for that caregiver’s attention,” argue Neufeld and Mate. Add onto this geographic dislocations and the deterioration of the extended family unit, children are much less likely to learn from elders, who are committed to their welfare, claim Neufeld and Mate. Therefore, “The secret to parenting is not in what a parent does but rather who the parent is to a child,” believe Neufeld and Mate. In other words, Neufeld and Mate write, “The power to execute our parental responsibilities lies not in the neediness of our children but in their looking to us to be the answer to their needs.” Ultimately, what Hold Onto Your Kids maintains is that attachment can help a parent protect a child, much in the same way the main character of the critically acclaimed film, Life is Beautiful, did during World War II. While you might not be able to change what’s going on in the world, you can make sure you aren’t prematurely replaced by following the advice in this book. It closes with powerful chapters on “Discipline that Doesn’t Divide” and “Re-Create the Attachment Village.” So whether it’s establishing the proper hierarchy in your home or keeping your children’s loyalty as they grow up, I highly recommend Hold Onto Your Kids, for Neufeld and Mate will help parents preserve the ties that empower their children.